According to CreditDonkey.com (funny name!) the average monthly cost of food is $244. If you are on a fixed income, lets say $900 per month, that $244 is 27% of your income. This doesn’t account for rent, utilities, a car note, heavens forbid you want health insurance! That 27% can be a major drain on your finances if you are a senior on a fixed income. In this article we’ll lunch program that helps seniors to not only save money on food, but also do a little sociaizing as well; that program is called Congregate Meals. How it differs from Meals on Wheels? Aside from food, what other services are offered? How you enroll in the program? Where is the nearest Congrgate Meals to you. In this next section we’ll tell you what exactly is Congregate Meals. 1 What Is Congregate Meals? 2 What Is The Different Between Congregate Meals and Meals On Wheels? 3 What Days Are Congregate Meals Served? 4 Who Is Eligible For Congregate Meals In Houston? 5 What Additional Services Are Offered By Congregate Meals? 6 How Do You Enroll In a Congregate Meals Program? Congregate Meals is a lunch program that offers one hot and nutritious meal to low-income seniors. In order for seniors to participate in the Congregate Meals program they must visit a local community center or chruch to receive their meal. What Is The Different Between Congregate Meals and Meals On Wheels? The primary difference is Congregate Meals are served at a specific location, while Meals on Wheels are delivered to your home. Each program requires that you be 60 years or older although to qualify for Meals on Wheels you must have mobility issues that would prevent you from getting to a Congregate Meals location. What Days Are Congregate Meals Served? Congregate Meals in Houston are served Monday through Friday, with the exception of holidays. Who Is Eligible For Congregate Meals In Houston? Seniors who are 60 years and older are eligible for the Congregate Meals Program in Houston. If you are 60 years and older although your spouse is younger, they also qualify for Congregate Meals. Another key piece to eligiblity is the zip code that you live in. You must live in the zip code of the Congregate Meal site. For instance, if you lived in Houston’s 770011 zip code you have the option of going to Harrisburgh Senior Center, Ripley House, and Magnolia Multi-Service Center because they all serve the 77011 zip code. Later in this article we will share a listing of zip codes and Congregate Meal locations assigned to those zip codes. What Additional Services Are Offered By Congregate Meals? How Do You Enroll In a Congregate Meals Program? To enroll you must visit or call the Congregate Meals Program that serves your zip code. They can provide you with more information regarding the enrollment process. 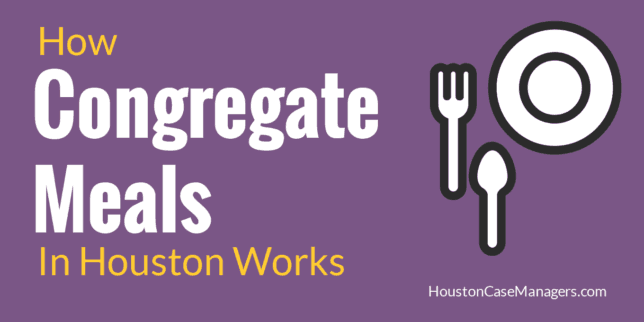 In the next section we will provide you with a listing of Congregate Meals locations in Houston. Where you go for your Congregate Meal in Houston will depend on the zip code you live in. Many Houston zip codes have at least one Congregate Meal site; some have multiple sites. At each site there is a Congregate Meal Contractor. This is the agency that manages the program and delivers the site. Below you will find Congregate Meal locations seperated by zip code. Simply search for your zip code and you will find the location, the agency who provides the meals and a phone number. Golden Age Hobby House – This is located at 2805 Winbern, Houston, TX 77004. The phone number is 713.526.2641. The Congregate Meal Contractor here is Neighborhood Centers. Indochinese Culture Center – The address is 3333 Fannin St, Houston, TX 77004. The phone number is 713.522.7799. 3rd Ward Multi-Service Center – The address is 3611 Ennis, Suite 118, Houston, TX 77004. The phone number is 713.527.4000. Montrose Counseling Center – The address is 401 Branard, 2nd Floor, Houston, TX 77006. The phone number is 713.529.0037 extention 378. West End Multi-Service Center – The address is 170 Heights Blvd, Houston, TX 77007. The phone number is 713.803.1067. Wesley Community Center – The address is 1410 Lee, Houston, TX 77009. The phone number is 713.223.8131 extention 255. Harrisburgh Senior Center – The address is 7250 Harrisburgh, Houston, TX 77011. The phone number is 281.979.4468. The Congregate Meal Contractor here is YWCA. Ripley House – The address is 4410 Navigation, Houston, TX 77011. The phone number is 713.315.6482. The Congregatge Meal Contractor here is Neighborhood Centers. Magnolia Multi-Service Center – The address here is 7037 Capitol Street, Houston, TX 77011. The phone number is 713.928.9590. Northeast Multi-Service Center – The address is 9720 Spaulding, Houston, TX 77016. The phone number is 713.928.9590. The Congregte Meal Contractor here is City of Houston. Denver Harbor Senior Center – The address is 6402 Market St, Houston, TX 77020. The phone number is 713.672.6395. J.W. 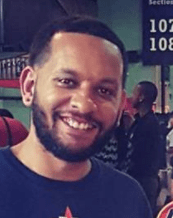 Peavy Senior Center – The address is 3814 Market St, Houston, TX 77020. The phone number is 832.393.3851. Gateway Senior Center – The address is 6309 Martin Luther King, Houston, TX 77021. The phone number is 713.868.9922. Kashmere Senior Center – The address is 4802 Lockwood, Houston, TX 77026. The phone number is 713.678.4690. The Congregate Meal Contractor here is Neighborhood Center. Heritage Hall – The address is 1025 Oates, Jacinto City, TX 77029. The phone number is 713.675.4487. The Congregate Meal Contractor here is City of Jacinto City. Oak Tree Senior Center – The address is 14603 Fonmeadow, Houston, TX 77035. The phone number is 832.258.3927. Bellerive Senior Center – The address is 7225 Bellerive, Houston, TX 77036. The phone number is 832.370.3495. West Office Senior Center – The address is 10303 West Office, Houston, TX 77042. The phone number is 713.784.9049. Hiram Clarke Multi-Service Center – The address is 3810 West Fuqua, Houston, TX 77045. The phone number is 832.393.4200. The Congregate Meal Contractor here is City of Houston. Kingspoint Senior Center – The address is 10900 Kingspoint Suite 6, Houston, TX 77045. The phone number is 832.705.4423. New Life Senior Center – The address is 4828 Almeda Genoa Road, Houston, TX 77048. The phone number is 713.732.5030. Sunnyside Multi-Services Center – The address is 9314 Cullen Blvd, Houston, TX 77051. The phone number is 713.732.5030. Clear Lake Presbyterian Church – The address is 1511 El Dorado Blvd, Houston, TX 77062. The phone number is 281.488.6731. The Congregate Meal Contrctor here is Neighborhood Centers. Southwest Multi-Service Center – The address is 6400 High Star, Houston, TX 77074. The phone number is 832.395.9900. Lakeview Senior Center – The address is 8959 Hammerly Blvd, Houston, TX 77080. The phone number is 713.722.0979. Longhorn Senior Center – The address here is 1414 Longhorn, Houston, TX 77080. The phone number is 713.465.6588. Harbach-Ripley – The address is 6225 Northdale, Houston, TX 77087. The phone number is 713.640.7119. NAM Senior Center – The address here is 15555 Kuykendalh Road, Houston, TX 77090. The phone number is 281.855.4623. The Congregate Meal Contractor here is Northwest Assistane Ministries. Acres Home Multi-Services Center – The address is 6719 W. Montgomery Road, Houston, TX 77091. The phone number is 713.695.9771. Chancellors Family Center – The address is 6535 Dumfries Street, Houston, TX 77096. The phone number is 713.772.9955. First Filipino Senior Center – The address is 8603 Kirkwood, Houston, TX 77099. The phone number is 281.498.7938. Salvation Army Senior Center – The address is 2732 Cherrybrook Lane, Houston, TX 77502. The phone number is 713.378.0020. The Congregate Meal Contractor here is Salvation Army. The Congregate Meal Contractor here is City of La Porte. South Houston Community Center – The address is 1018 Dallas, South Houston, TX 77587. The phone number is 713.947.7700. The Congregate Meal Contractor here is City of South Houston. The average person spends $8 per day on food. Yes we got this stat from CreditDonkey.com also. While Congregate Meals only provides you with one meal per weekday you can still look at a savings of $60 per month if you take them up on their offer. With a fixed income you will have to find ways to budget and Congregate Meals is a good starting point. In addition to the free meals you also receive an opportunity to socialize and exercise which both contribute to a better quality of life. If you are interested in enrolling in a Congregate Meals Program in Houston, simply go here, find your zip code and then give them a call for more information. If you are living on a fixed income what tips do you have to help others save money?